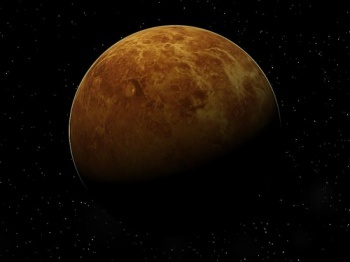 At least, pictures of the surface of Venus have some likely candidates including, a "black disk" and a "scorpion". Venus is relatively close in size to the Earth, but astronomers have long believed our sister planet to be covered with acidic fog clouds devoid of any life. Temperatures on the surface reach as high as 460 Â°C due to an intense greenhouse effect of the pressurized carbon dioxide atmosphere. There might have once been oceans on Venus, but scientists believe there hasn't been liquid water for almost 2 billion years. Despite all that evidence, Leonid Ksanfomaliti of the Space Research Institute of Russia's Academy of Sciences won't rule out the possibility of life on Venus. Ksanfomaliti bases his hope on photos taken by the Soviet probe Venus-13 all the way back in 1982. Some of these photographs reveal shapes that could be organic such as a "disk", a "black flap" and a "scorpion". "What if we forget about the current theories about the non-existence of life on Venus, let's boldly suggest that the objects' morphological features would allow us to say that they are living," Ksanfomaliti wrote in an article published in the Solar System Research scientific journal. I think Ksanfomaliti is definitely bold for suggesting there could be life under those acidic clouds perfectly adapted to high temperatures and poisonous atmosphere but the thought experiment is more fiction than science. I once imagined that Venus was the birth place of the human race and we barely escaped the ecological disaster there to colonize Earth, but I was ten. Fantasies like that and Bradbury's All Summer in a Day is about as close as we're going to get to life on Venus. Sorry, Leo.